American Jason W. Long moved to Japan to teach English in 2005. Earthquakes are a common occurrence in his part of the country, so Long is accustomed to feeling the ground shake. What he wasn’t expecting was the 9.0 earthquake and resulting tsunami that struck Japan on March 11, 2011. 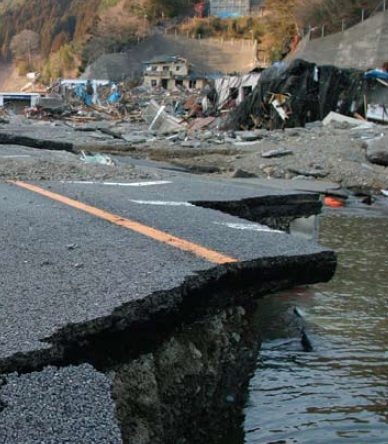 The tsunami did not make it as far inland as Jason’s town, but more than 13,000 people were killed in Japan and repercussions were felt throughout the world. 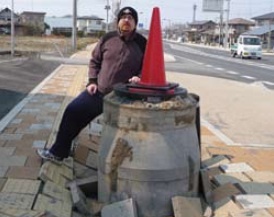 Jason Long stands next to a manhole that raised out of the street during the March 11, 2011, earthquake in Japan. Photo courtesy of Jason Long and Austin Monthly magazine. It was a Friday afternoon at 3:46 when the first earthquake hit, and I was in the teacher’s workroom at the elementary school where I teach. At first it felt like just another earthquake, but instead of stopping, it got stronger. Desks were shaking, computer monitors started falling and an enormous safe shimmied about a foot out from the wall. That’s when I knew this was serious. The quake stopped after about a minute, and all of us teachers went to make sure the students were okay. We were going to take them to the gym, but some of the ceiling tiles and floodlights had fallen down, so we took everyone outside to the playground instead. At that point, it was very little thought, all action — I just needed to make sure the kids were safe. A minute or two later, the second earthquake hit. I was standing 10 or 15 yards from the school. When I looked up, the three sections of the building, which are about a foot apart, were each swaying separately. I felt really small next to these enormous buildings swaying like leaves on a tree. I wasn’t scared, exactly, maybe scared hopeless. No one reacted much; it wasn’t until a few minutes later that students started crying and screaming. Afterward, I waited until students’ parents had picked them up, and then I headed home. On the road to my apartment, all the manholes had lifted a foot and a half above the road. I gathered food and blankets and went to meet my wife at her parents’ house about 20 minutes away in Hitachinaka. Neither my apartment nor my in-laws’ house had electricity, gas or water, so over the next week, getting basic necessities occupied most of our time. We stood in line for hours waiting for our water rations of two liters a day per person present, never mind that two elderly people, including my wife’s grandfather, were waiting at home. Gas was also rationed to about two gallons per car, and it was only available for a short time in the mornings. I was lucky to have a full tank, but many people left their cars parked in line overnight outside gas stations. A couple days after the quake, while waiting in line for water, I glanced over at the intersection 50 yards away, and saw that the red and green crosswalk lights had started flashing. I couldn’t believe it: The power was back. I would be able to call my parents and tell them I was alive. At my wife’s parents’ house, there was still no power. But it was okay; we had water and food, though perishables were still hard to come by. We ate off plastic wrap–topped plates since we couldn’t wash dishes. Luckily, we had extra water from the bathtub, which the Japanese leave filled, so we used that for the toilet. On Sunday night, the power did come back on, but that was the worst night of the whole ordeal. Until then, we had only heard about what was going on in the rest of the country, but that night we were able to watch TV. We sat there and watched nearby people, buildings and cities being washed away. It was unreal. I kept asking myself why this was happening to people 100 miles north of me and not to me. There were a lot of concerns during that time about the radiation from the Fukushima power plant, which is about 60 miles away. A few days after the quake, my wife and I were walking to get water, and my mother-in-law drove to find us. It was supposed to rain, she said, and there were worries that the rain would be radioactive. Destruction caused by the earthquake. Photo courtesy of Jason Long and Austin Monthly magazine. The school reopened Monday, but I didn’t go back until Tuesday because there was so much to do at home. Then I stayed with a friend because it was closer to work. He had running water, so I got to brush my teeth and take my first shower. I’d been at my friend’s apartment for about a week when I learned the power and water were back on in my neighborhood. My wife and I went back to our apartment to assess the damage. We were really lucky. A lot of stuff had fallen and there was some damage at the entryway, but the tab of a single CD case was the only thing that had broken. Life slowly returned to normal. Neighborhood by neighborhood, power, water and gas came back on. Restaurants and grocery stores reopened, though it was still tough to find perishable foods. For the next few months, I had trouble sleeping because I was worried about things falling and killing me. But in the end, I feel lucky. I’m still alive, and I’m so happy that I have people who care about me. Friends and family kept calling, and when I was able to go online, I had 75 emails and two pages of Facebook comments asking if I was okay. All that love was heartwarming. ← What’s it like to work amidst the Mexican drug violence? I felt like I was there with them for a little while. Hard to imagine the challenges of no water or electricity, things we take for granted every day.